Renaissance artists greatly admired the works of art of the Ancient Greeks and Romans: they often debated whether modern artists should just follow the pattern provided by the ancient statues and paintings or should they go beyond those models and try to innovate. In general there was a consensus on the latter option and Michelangelo in particular was regarded as the modern artist who more than others had been successful in surpassing the ancient masters. In the second half of the XVIIIth century, mainly as a consequence of the art theories developed by J. J. Winckelmann, the works of art of the ancient world were regarded as by far superior to those developed by Michelangelo in his late years and by the artists who followed him. This change led to a renewed effort to recover and restore the monuments of the past, to the detriment, if necessary, of the modern buildings erected making use of foundations, walls, columns of ancient constructions. In Rome, excavations were initiated by the French administration and were carried on by Pope Pius VII. The Arch of Titus was in part rebuilt and isolated from the adjoining buildings; the lower parts of the Arch of Septimius Severus and of the Temples next to the Capitol were freed. But in 1823, the death of the pope and the great fire which destroyed S. Paolo fuori le Mura slowed down this effort: the successors of Pius VII did not have his same cultural interests and the cost of rebuilding S. Paolo fuori le Mura did not leave resources for other activities. 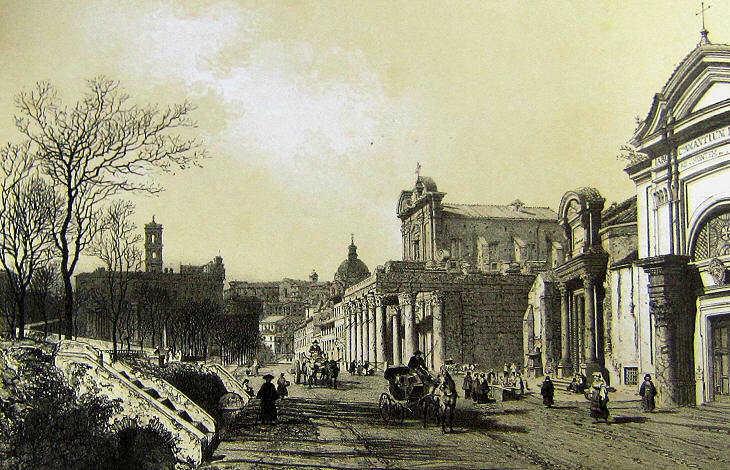 In 1865 Campo Vaccino was no longer a cattle market, but a large alley which was flanked on one side by a row of churches and monasteries built on the ancient temples and showing a peculiar mixture of architectonic styles. 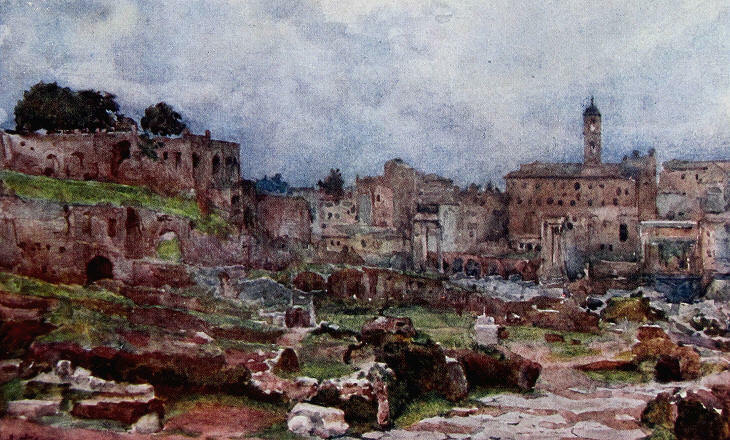 Philippe Benoist chose a wintry afternoon for this fine view of the Roman Forum: the area was outside the city center and Benoist did not show many carriages and passers-by: Rome had still a rather sleepy appearance. 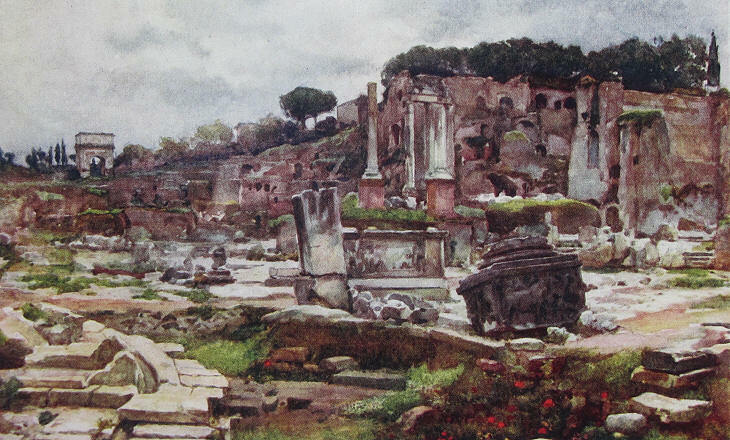 In a matter of a few decades Campo Vaccino disappeared (the name itself is known by very few Romans nowadays) and the area was entirely excavated to bring to light the foundations of the ancient temples. Alberto Pisa shows a view of the Roman Forum towards the Capitol taken from a rather unusual angle which excludes the churches which still exist immediately to the right of the Arch of Septimius Severus. Pisa followed the same approach in the view towards the Arch of Titus, where he excluded the churches immediately to the left of the Arch. Clearly he thought that the readers of his book would have liked to see the monuments of the past in isolation without any Baroque interference. 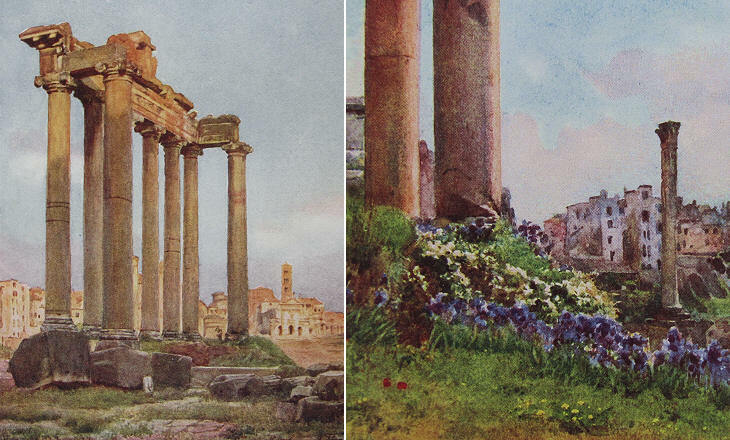 It is interesting to note that in both views he chose to paint a cloudy sky, which emphasizes the melancholy of the ruins. The Palatine had been for centuries a property of the Farnese who built there a summer residence: in the second half of the XIXth century their estate was split into several parcels, two of which were acquired by emperors (Napoleon III of France and Nicholas I of Russia), maybe intrigued by the fact that the Roman emperors had their palace on this hill. The excavation of the Palatine, promoted by these emperors was completed by the Italian Government which in 1871 acquired their properties. 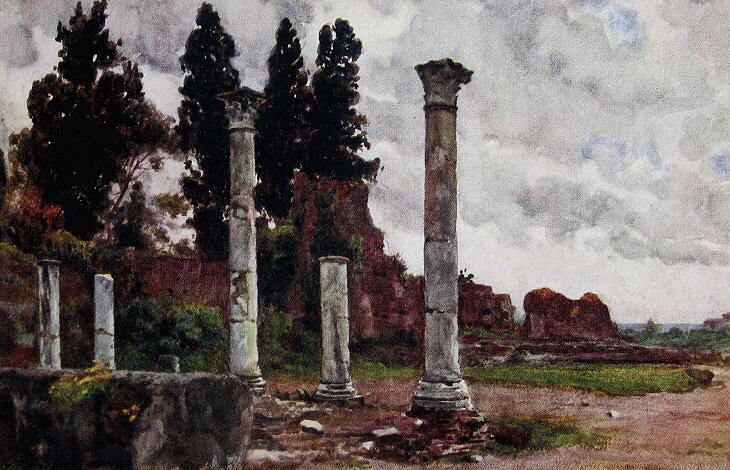 The painting by Alberto Pisa shows some columns which had been assembled using broken segments against the background of a row of cypresses and a cloudy sky. O'er steps of broken thrones and temples, Ye!" .... and his painting met their expectations. Travellers to Rome were all too happy to ponder on the destiny of mankind sitting on a broken column and listening to an owl on a cypress, but they were also very happy to enjoy the mild climate of the Eternal City and to observe the vegetation which grew in the cracks of the ancient stones. 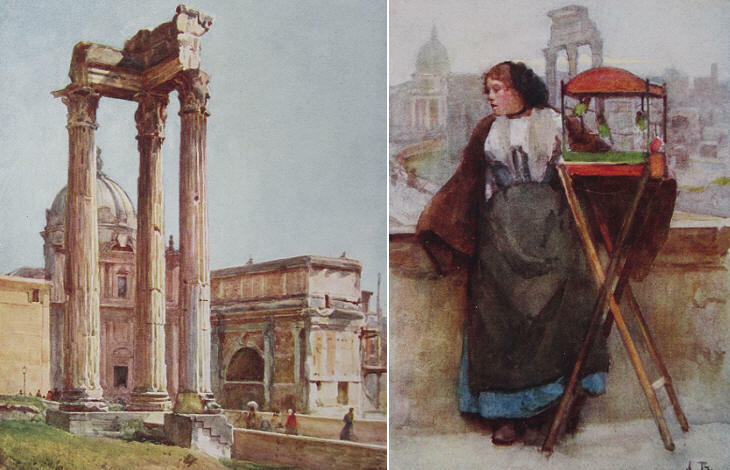 Armchair travellers had similar interests and Pisa thought to offer them some more vivid views (above and below) of the Roman Forum: the row of houses on the left of the first painting do not exist any longer: they were pulled down in the 1930s when the Imperial Fora were excavated.